Good morning, Friends! 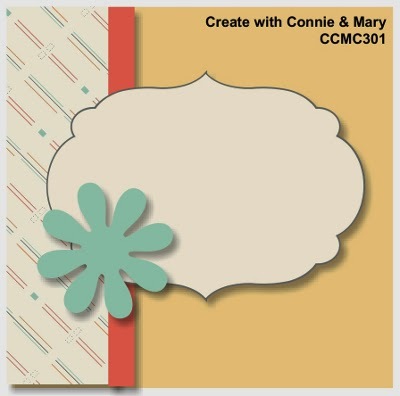 It's time for another great Thursday challenge from the Create with Connie and Mary team! This week we have a fabulous sketch to work with! Take a look! Find more inspiration at the Create with Connie and Mary website! I hope you will play along with us this week! We love to see what you do with our challenges! Thanks for stopping by and have a super day! Love all of the white on your card. It is so clean and beautiful. The flower accent is just the perfect touch! Love how the silver foil looks like a strip of ribbon. Beautiful card! You always make the most stunning clean cards! This is beautiful as always! Love the double flower on this. What a beautiful crisp white card! I love how the focal point stands out against the white. Amazing job as always! What a soft color combo - I love the touch of added sparkle of the foil paper! Beautiful!